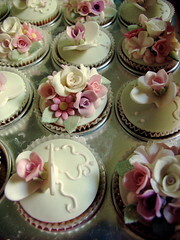 More of our specialty...embossed cupcakes! 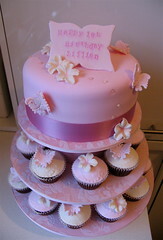 We have a gorgeous new range of wedding cakes!! 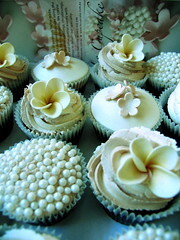 Medium sized, they add a special magic to your day! 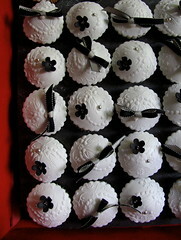 Impress your guests with some bling!! 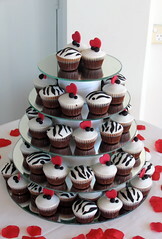 Chocolate mud cupcakes decorated to a red, black & white theme with hearts & zebra patterns. 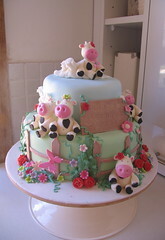 Gorgeous mirror stand is exclusive to "Le Cupcake"
Edible icing cows (each personalised) on a 2 tiered madiera cake decorated as a grassy farm with a blue sky & clouds! 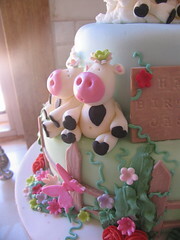 A close up of a farm cake with cows............these 2 cows are having a day out!! 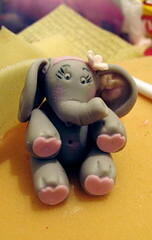 Edible sugar elephant to go on top of a cupcake........any animal can be done in any colour! 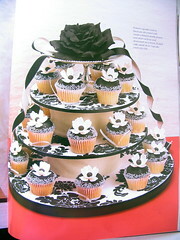 Made on short notice for the "Home Beautiful" Magazine.